Saint Xenia lived during the eighteenth century, but little is known of her life or of her family. She passed most of her life in Petersburg during the reigns of the empresses Elizabeth and Catherine II. Xenia Grigorievna Petrova was the wife of an army officer, Major Andrew Petrov. After the wedding, the couple lived in Saint Petersburg. Saint Xenia became a widow at the age of twenty-six when her husband suddenly died at a party. She grieved for the loss of her husband, and especially because he died without Confession or Holy Communion. Once her earthly happiness ended, she did not look for it again. From that time forward, Xenia lost interest in the things of this world, and followed the difficult path of foolishness for the sake of Christ. The basis for this strange way of life is to be found in the first Epistle to the Corinthians (1 Cor. 1:18-24, 1 Cor. 2:14, 1 Cor. 3:18-19). The Lord strengthened her and helped her to bear sorrow and misfortune patiently for the next forty-five years. She started wearing her husband’s clothing, and insisted that she be addressed as “Andrew Feodorovich.” She told people that it was she, and not her husband, who had died. In a certain sense, this was perfectly true. She abandoned her former way of life and experienced a spiritual rebirth. When she gave away her house and possessions to the poor, her relatives complained to the authorities. After speaking to Xenia, the officials were conviced that she was in her right mind and was entitled to dispose of her property as she saw fit. Soon she had nothing left for herself, so she wandered through the poor section of Petersburg with no place to lay her head. She refused all assistance from her relatives, happy to be free of worldly attachments. When her late husband’s red and green uniform wore out, she clothed herself in rags of those colors. After a while, Xenia left Petersburg for eight years. It is believed that she visited holy Elders and ascetics throughout Russia seeking instruction in the spiritual life. She may have visited Saint Theodore of Sanaxar (February 19), who had been a military man himself. His life changed dramatically when a young officer died at a drinking party. Perhaps this officer was Saint Xenia’s husband. In any case, she knew Saint Theodore and profited from his instructions. 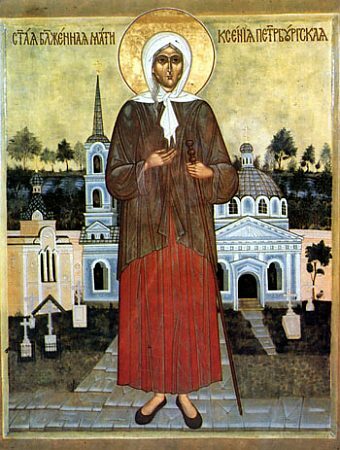 Saint Xenia eventually returned to the poor section of Petersburg, where she was mocked and insulted because of her strange behavior. When she did accept money from people it was only small amounts, which she used to help the poor. She spent her nights praying without sleep in a field outside the city. Prayer strengthened her, and in her heart’s conversation with the Lord she found the support she needed on her difficult path. When a new church was being built in the Smolensk cemetery, Saint Xenia brought bricks to the site. She did this in secret, during the night, so that no one would know. Soon her great virtue and spiritual gifts began to be noticed. She prophesied future events affecting the citizens of Petersburg, and even the royal family. Against her will, she became known as someone pleasing to God, and nearly everyone loved her.They said, “Xenia does not belong to this world, she belongs to God.” People regarded her visits to their homes or shops as a great blessing. Saint Xenia loved children, and mothers rejoiced when the childless widow would stand and pray over a baby’s crib, or kiss a child. They believed that the blessed one’s kiss would bring that child good fortune. Saint Xenia lived about forty-five years after the death of her husband, and departed to the Lord at the age of seventy-one. The exact date and circumstances of her death are not known, but it probably took place at the end of the eighteenth century. She was buried in the Smolensk cemetery. By the 1820s, people flocked to her grave to pray for her soul, and to ask her to intercede with God for them. So many visitors took earth from her grave that it had to be replaced every year. Later, a chapel was built over her grave. Those who turn to Saint Xenia in prayer receive healing from illness, and deliverance from their afflictions. She is also known for helping people who seek jobs. Having lived as a stranger in the world, / you outwitted the deviser of evil / by your pretended foolishness, O Xenia. / You received the grace from God / to foresee and foretell things to come. / Now, as you have been translated from earth to heaven, / you are numbered with the choirs of the angels. Podoben: “Today You have shown forth...” / You gave your wealth to the poor, O Xenia, / and accepted poverty out of love for Christ; / having lived a life rivaling the angels, you were accounted worthy of glory on high.